"More fish for the cat at table two?!" 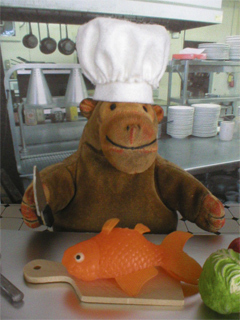 Whether he's trotting around a Victorian kitchen or making a tasty snack for Mr Cat by slicing fish in a modern restaurant kitchen, Mr Monkey dons his chef's toque before starting any culinary enterprise. That way everyone else in the kitchen knows who the boss is. 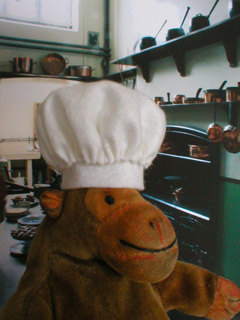 Mr Monkey's chef's hat is made entirely from good quality felt, using instructions from the About.com website. Mr Rik actually had to sew, with a needle.